Stephen Vaughan Jr. announced earlier today that 5 Division World Champion Roy Jones Jr. will be coming to Liverpool, England to headline his upcoming event at the Aintree Equestrian Centre in Liverpool on Saturday 12th September 2015. Jones Jr, claimed his first World title with a unanimous points victory over Bernard Hopkins at the RFK Stadium in Washington DC back in May 1993 for the IBF version, which he successfully defended against Thomas Tate before challenging and beating James Toney for his IBF Super Middleweight crown in 1994. Jones Jr. successfully defended the Super Middleweight title five times, against Antoine Bird, Vinnie Pazienza, Tony Thornton, Eric Lucas and Bryant Brannan, before moving up to Light Heavyweight to successfully challenge Mike McCallum for the WBC interim World Light Heavyweight title in November 1996. Four months later Jones Jr. was back in the ring again, to challenge Montel Griffin for the WBC World Light Heavyweight Crown, however instead of securing the win Jones jr. was disqualified striking Griffin after he went down on one knee in the ninth round. In the rematch in August ’97, Jones Jr. finally secured the WBC Light Heavyweight crown with a first round knockout to add his third World crown in a third division. In July 2008 Jones Jr. added the WBA Light Heavyweight title to his collection after unifying the WBC and WBA Light Heavyweight championships with a unanimous points victory over reigning WBA champ Lou Del Valle. Jones successfully defended both the WBC and WBA titles against Otis Grant and Richard Frazier, before unifying the division with the IBF Light Heavyweight belt with a points victory over Reggie Johnson in 1999. In January 2000 Jones Jr. started off the new Millenium with a unified defense victory over David Telesco, which he followed up with a successful defense of the three titles with a eleventh round stoppage victory over Richard Hall in May. In September 2000 Jones Jr. added the IBO version to his collection after defending Champ Eric Harding retired in the tenth round of their bout at the New Orleans Arena. Jones Jr. successfully defended the four titles against Derek Harmon in February 2001 before successfully challenging World Boxing Federation Champion Julio Cesar Gonzalez for his crown as well as adding the vacant IBA version to his collection. Jones Jr. successfully defended his six Light Heavyweight titles against Glen Kelly and Clinton Woods, before surprising most observers when he moved to the Heavyweight division to successfully challenge John Ruiz for the WBA World Heavyweight crown in March 2003. In November of the same year Jones Jr. went back to the Light Heavy ranks and successfully defended his WBC, WBA and IBO titles against Antonio Tarver, six months later the pair would face off against one and other again, this time it was Tarver that emerged victorious and claiming the WBC, WBA, IBO, IBA and vacant World Boxing Foundation titles. In September of that year Jones Jr. lost the IBF version to Glen Johnson following the Floridian being knocked out in the ninth. In October 2005 Jones Jr then unsuccessfully challenged Antonio Tarver for the IBO Light Heavyweight title. With no World titles in his possession Jones Jr successfully challenged Prince Badi Ajamu in July 2006 for the WBO NABO Light Heavyweight Crown and almost one year to day later beat Anthony Hanshaw for the vacant IBC Light Heavyweight World title. In March 2009 Jones Jr beat Omar Sheika for the vacant WBO NABO title, which he successfully defended against Jeff Lacy before unsuccessfully challenging Danny Green in December 2009 for his IBO Cruiserweight crown. It would not be until December 2013 that Jones Jr. was to be in World Championship action once more, when he travelled to Moscow to successfully challenge Zineddine Benmakhlouf for the vacant WBUv World Cruiserweight title. Jones Jr Successfully defended the title against Courtney Fry, Hany Atlyo and most recently Paul Vasquez. Next up for the legendary five division World Champion, when he fights in Liverpool on September 12th, well at this point there are a number of opponents in the hat, so we will have to wait a short while until terms are agreed with some of those names. 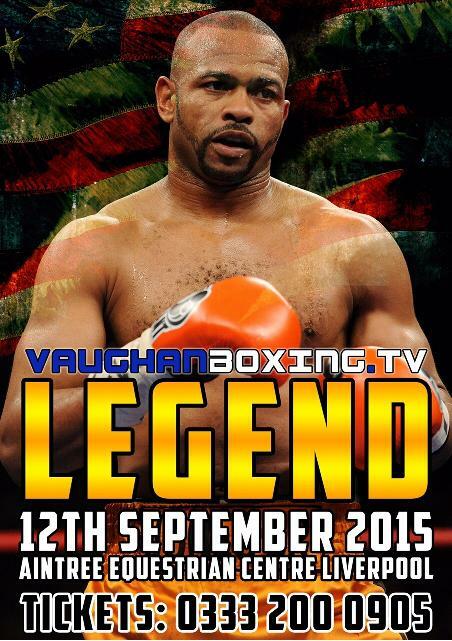 Tickets for the Stephen Vaughan Promoted Roy Jones Jr. headed event at the Aintree Equestrian Centre in Liverpool on Saturday September 12th 2015 will go on sale shortly, call 0333 200 0905 and the tickets will also be available on line at www.tkoboxoffice.com and and www.vaughanboxing.tv from next Monday.